Solar process heat has gained popularity in the centre of India’s silk production – more specifically, in Sidlaghatta, a town in the southern state of Karnataka. The statistics of Karnataka’s Department of Sericulture shows that a little over 1,500 units between 2 and 10 m² have been switched from wood or briquettes to solar for preheating the traditional stoves. 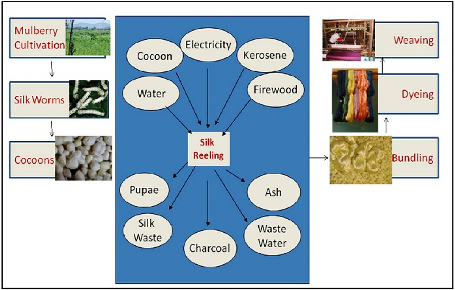 The Department of Sericulture has been promoting the technology among silk producers by providing a 75 % subsidy for any reeling unit partly heated by solar energy. The use of sunlight can cut firewood consumption in half. The sericulture industry requires hot water at up to 70 °C for producing yarn from the cocoon of a silkworm. The protein sericin is removed by placing the cocoons in hot water. This process is called degumming, as the sericin functions like gum for coating the fibres. The hot bath then frees the silk filaments, making them ready for reeling. Individual filaments are subsequently combined to form thread and wound onto reels (see the figure at the end of this article). Traditionally, people have used wood- or briquette-fired stoves to heat the water. Reeling 1 kilogram of silk requires, on average, 26 kilograms of firewood because traditional stoves show poor efficiency, not exceeding 18 %. Massive deforestation and the high price of wood and coal have made it necessary to search for highly efficient and sustainable alternatives. 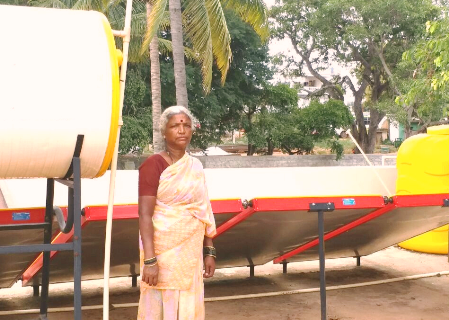 One of southern India’s solar thermal manufacturers Nuetech Solar Systems realised the potential for solar water heaters in this industry and carried out an awareness campaign amongst the weavers. According to Nuetech CEO Ananth Thyagmundlu this resulted in almost 1,200 solar process heat installations in Sidlaghatta so far. With 7,000 silk-reeling micro-units, Sidlaghatta is globally renowned for its silk production. It has the state’s second-largest market after Ramanagara.